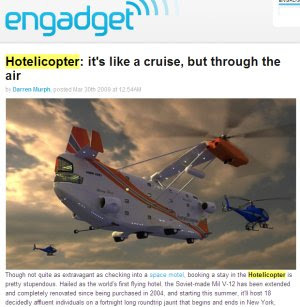 A few days ago, there was a post on Engadget hailing the maiden voyage of the Hotelicopter. The post garnered over 80 comments but is now completely gone. What gives? 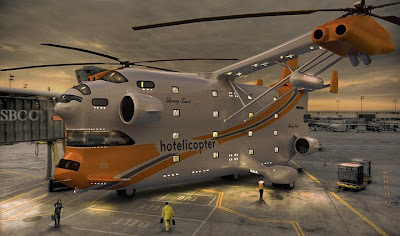 It appears that they and others got caught with their crap detectors turned off and they fell for a beautifully constructed hoax, perpetrated at www.Hotelicopter.com and kicked off with a couple of posts to Twitter . The intentionally viral marketing campaign was set to draw attention to the European airport hotel, Yotel . Inspired by the first class accommodations on British Airways flights, they've built futuristic looking micro hotels inside airports, not in converted Russian Helicopters. We wish we could show you the promotional video at Vimeo, but it's gone. What we can offer you is one last look at the flying hotel that never was.